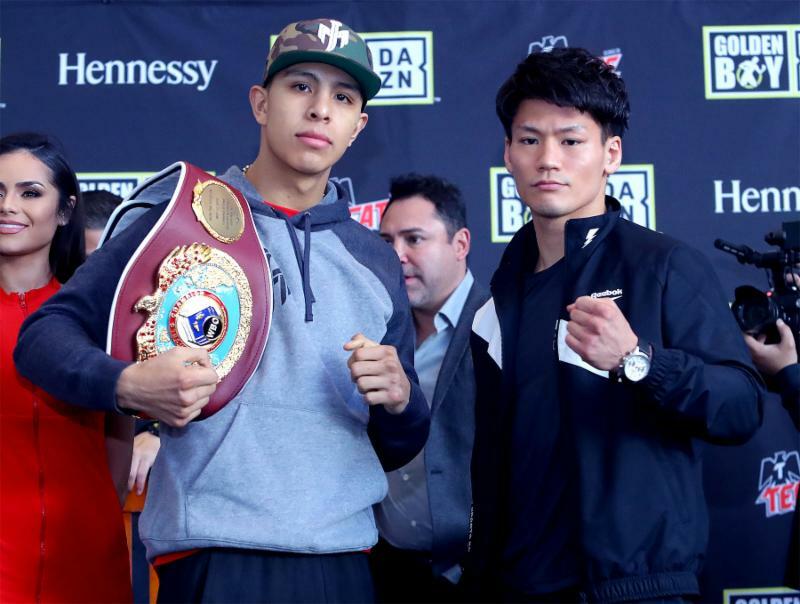 HOUSTON (Jan. 29, 2019): Mexican warrior Jaime Munguia (31-0, 26 KOs) and Japanese contender Takeshi Inoue (13-0-1, 7 KOs) hosted the final press conference ahead of their 12-round battle for Munguia's WBO Junior Middleweight World Title. The action will take place on Saturday, Jan. 26 at the Toyota Center in Houston, Texas and will be streamed live on DAZN - which is just $9.99 per month after a one-month free trial. Fans in Houston can purchase tickets starting at just $25 at ToyotaCenter.com. "We're very happy to be here in Texas. It's my first time in Texas and I feel at home here. They've received me very well. I want to tell people that we came here well-prepared and we're in good condition. I want to tell Inoue that the title will not go to Japan, it will stay in Mexico and I will be champion for a while. Expect a big fight Saturday night." "I want to thank everyone who made this fight possible. I think Munguia is a great champion, and I look forward to a great fight on Saturday. I have come here to bring the WBO belt back to Japan." "I'm greatly happy to be here and I'm anxious for the fight we have this Saturday. We're a day from making weight and I'm anxious and I'm excited. It's my first time here. I hope Xu Can comes prepared to fight so we can give a great show, a real spectacle, to the fans of Texas." "I'm very happy to be here in Houston. This is my second time fighting in the USA. It's going to be my first time challenging the world title and I have confidence I can bring the world title back to China. I'm very excited for Saturday night." "I'm really excited to be fighting here. I haven't fought in Texas in a little over a year, and I kind of missed it. I'm really grateful to be in this position. I'm looking forward to fulfilling my dad's and Oscar's expectations and getting a world title this year. At this moment right now I'm ready for this world title. There's no one at 140 who can beat me right now. I'm really confident in myself and my ability to get this world title." "I'm looking forward to eating Whataburger right after this fight." "The primary reason why I'm really excited to promote this event here in Houston is because it brings back big-time boxing to Houston. That's exactly what our motive is for the year and for the years to come: to bring boxing back to the masses and bring boxing back to the fans." "I remember many years ago we promoted many great world title fights in Houston here at the Toyota Center with the likes of Juan Diaz, Juan Manuel Marquez against Katsidis. Houston has a rich history and fans have shown tremendous support to the sport of boxing. We at Golden Boy Promotions look forward to cultivating and growing and soon making local world champions here from Houston." "This event is very important because not only does it mark a great relationship with one of the - if not thebest promoter in Mexico - in Zanfer Promotions, Fernando Beltran, but it's also important because it's the first of many events that we will be streaming live on the new digital platform DAZN. I strongly feel that DAZN has really changed the game in many ways. There are many people who love watching boxing throughout the United States but sometimes it's a little too expensive to watch a pay-per-view fight. We're extremely fortunate to have a partner like DAZN who can come in and stream the fights for a relatively inexpensive price of $9.99 per month. For $9.99 a month, and the first month is free, you can watch this amazing card Saturday night, with two world titles on the line, but you can also watch the highly-anticipated fight between Canelo Alvarez and Daniel Jacobs on Cinco de Mayo weekend, which is the biggest boxing event of the year." "When Jaime Munguia won the title and surprised the world, of course we needed to do a strategic partnership with somebody, because the division is so hot between the super welterweights and middleweights. The best division is middleweights and DAZN has got the two best middleweights in the world - without a doubt Canelo Alvarez and Daniel Jacobs. That's the way DAZN does boxing. Of course, we believe we are at that level with Jaime Munguia, and close to being in that mix, and we're with the right people and the right platform and we feel very happy about it."